Last weekend at a dear friend’s annual Crawl for a Cure event, I met an auto mechanic and a home remodeler. As we talked about our careers and I let them know about Elemental Blue, I quickly realized I was talking to two people who could significantly benefit from using Elemental Blue kukui oil on their rough, dry hands. Of course, I let them know about this miracle oil, and they asked a few questions which I was happy to answer. This kind of situation happens a lot. I can quickly identify who can benefit from kukui oil. And there are so many situations where kukui oil can help! Your son has eczema? Try kukui oil! You burned your hand on the stove? Try kukui oil! Have itchy mosquito bites? Try kukui oil! I’m like the father of the bride in the movie My Big Fat Greek Wedding who believed Windex was a cure-all for everything and made a point to tell everyone he possibly could when he thought it could help. Call me crazy, but I’ve noticed so many positive results when using kukui oil and have seen it help others in many ways, including my husband, Rob. When I discovered it, we were in Hawaii where the kukui nut tree thrives. 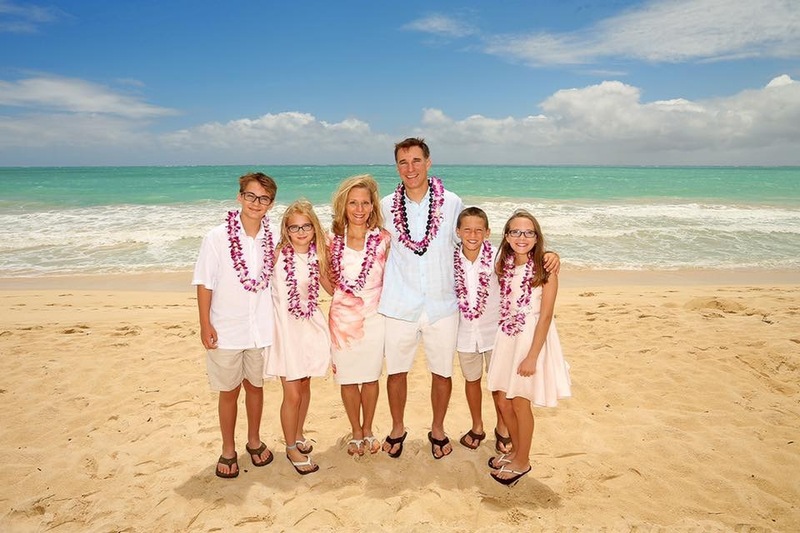 Rob and I flew our four kids to Oahu to make our union and blended family official. It was our first full day at the beach about a mile from the hotel. The beach was long and winding, and Rob decided to walk it to see where it led. After an hour passed and Rob was nowhere to be found, I started to worry. With kids in tow, I walked the same path and couldn’t find him. After waiting another 20 minutes where we left our bag, Rob was still nowhere to be seen, so we drove to the hotel to see if he had walked back. He wasn’t there either. Thoughts of leaving Hawaii without getting married and without Rob started to creep into my mind and the kids were visibly worried at this point too. Finally, we heard a knock on the door. As I rushed to open it, there he stood with only his swim shorts on, badly sunburned and not happy to say the least. Ironically, we had been walking in circles at the beach, but at opposite points, so we never met up. Once we left with the bag, he eventually came back around and noticed we were gone, so he made the long walk back to the hotel. What a way to start our special trip to Hawaii. Thankfully, I had bought a bottle of kukui oil the night before after a local store owner raved about all of its skin protecting and healing benefits. I applied it to his back every day, and amazingly he never peeled. That’s when I knew I had to learn more about this oil and expand my soap shop to offer it too. Since selling our kukui oil, we’ve received nothing but positive reviews – from those who used it to heal their eczema and those who treated their sunburns. Someone even told me it helped heal their psoriasis. A couple of months ago, I was brought to tears when a loyal customer wrote me to let me know she had used it to help heal her scars after having a surgery. She was so happy with the results that she later bought a bottle for a friend who had breast cancer and had to undergo a mastectomy. Maybe now you can understand my infatuation with kukui oil. So when you notice my future kukui oil posts or ads or hear me suggest to someone to try it, you’ll know my message comes from the heart, similar to the father of the bride, but with actual results.